Senator Paul Njoroge blames DP Ruto over his troubles in the Nominations and VIVO MD Igathe. - Bana Kenya News, Real African Network Tubanane. Home featured News Senator Paul Njoroge blames DP Ruto over his troubles in the Nominations and VIVO MD Igathe. Senator Paul Njoroge blames DP Ruto over his troubles in the Nominations and VIVO MD Igathe. The controversial senator Paul Njoroge has blamed DP Ruto over his troubles in the Nominations. Njoroge has ignited another fight with DP Ruto claiming that he is behind the woes that Central Kenya leaders are facing. Addressing his supporters in Naivasha, the senator claims that RUTO is systematical locking out leaders who are stumbling block to his political ambitions. Njoroge added that the Central region is still rethinking and calculating its decisions for supporting presidential bid in 2022. "The DP has resorted to being using government agencies to lockout ambitious politicians who are opposed to his leadership style and the just concluded nominations were part of his plan," Said Njoroge. 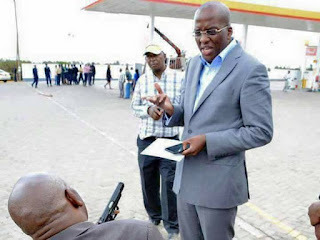 Earlier5 this year, he was charged in court with creating disturbances following shooting at a petrol station after confronting VIVO CEO Polycarp Igathe. "Ruto should know that there is Gideon Moi who will be running for the presidency in 2022 so people may change mind later after the elections." he added. He recalled the attack as a well-orchastrated plot to lock him out of business and politics. " Mr. Igathe was instrumental in making sure I got ashamed in an expense of getting to the public and getting the Gubernatorial Hon Mike Sonko running mate" he stated.